The 18-year-old man who was shot and seriously injured at the Maniwaki courthouse yesterday is currently in a coma, according to his mother. The woman cannot be identified in order to protect the identity of her son, who was at the courthouse to be sentenced on a charge under the Youth Criminal Justice Act. She spoke to CBC News from Hull Hospital in Gatineau, Que. She said her son had just received a six-month sentence and was waiting to be transferred to jail when the scuffle broke out. Her son wanted a smoke break, she said, but was told he couldn't take one because he had been remanded into custody. Quebec's police watchdog, the Bureau des Enquêtes Indépendantes (BEI), said the 18-year-old took a baton off the special constable during the altercation and began hitting him with it. The special constable then fired his gun, shooting the man in the head, according to a BEI news release. The bullet entered the man's skull near his nose and is currently lodged in the side of his neck, his mother said. The special constable was also injured, according to a spokesperson for Quebec's provincial police. 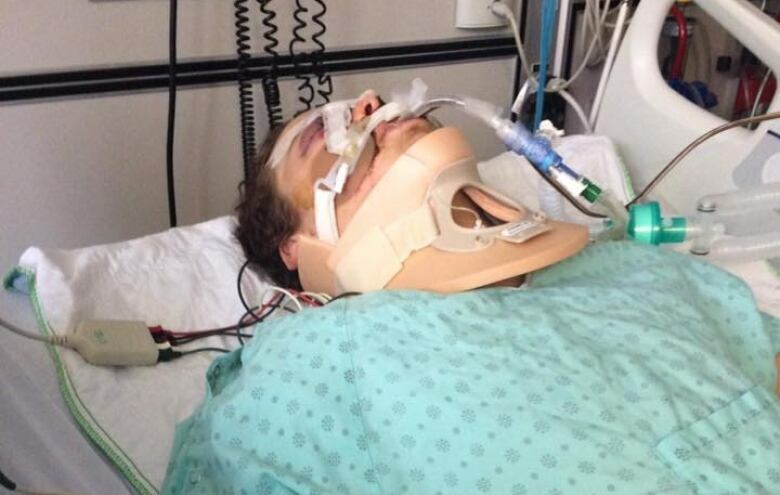 He was taken to hospital but has since been released, according to the head of the Quebec special constables' union. Thursday morning, a woman outside the courthouse said her son saw the scuffle and the aftermath of the shooting. 18-year-old seriously injured in shooting at courthouse in Maniwaki, Que. CBC News is not using her name because it could identify her 17-year-old son, whose identity is protected under the Youth Criminal Justice Act. "In the video clip I see and hear my son during the whole scuffle," she said. "It was absolutely terrifying … When I talked to him last night you could hear the fear," she said. "As a mother you know when your child is scared." In a news release Thursday, the president of the Quebec special constables' union Franck Perales said the organization has been arguing for years that more special constables should be stationed at courthouses. Citing the shooting as an example, Perales said the lack of trained constables is putting the safety of both officers and the public at risk. Special constables are peace officers who work in courthouses and other government buildings. They're equipped with pepper spray, a firearm and a collapsible baton, Perales said, and handcuffs. Maniwaki resident Pierre Lafond said he thinks special constables shouldn't be using guns. "They should have Tasers and be prepared for stuff like that," he said. "Yesterday, you could tell they were not prepared." The special constables do not carry Tasers. A video of the incident appears to show only one special constable in the room at the time, Perales said, with four other guards nearby. The union also said it will be pushing back against the use of private security guards in courthouses. Previously, it launched a suit against Quebec's Ministry of Justice and Ministry of Public Security over the issue. Arguments are expected to be heard in court on Feb. 5. Perales said private security employees lack the training to handle situations like what occurred on Wednesday. MÀJ Maniwaki. Les enquêteurs ont quitté la scène à 05h35 ce matin. L'enquête se poursuit.